It's not that cupcakes are my only trick, it's that they're easier to handle and decorate than cakes, bake more quickly, easier to give away, and easier to eat. I'm thinking those factors are the driving force behind the cupcake's surge in popularity lately. Whatever it is, I'm deep in it. I've been craving carrot cake for a while - dense, rich, spicy, and much more substantial than most other cakes. I've found it's also one of those "I don't like cake, but..." type desserts - it stands out for people. I didn't have a good recipe, so I went with Alton Brown's overly fussy take, and it turned out pretty well. As directed, I didn't include any nuts or raisins, but I may next time - they still turned out really well. As you can see, I also went a little wacky with the decorating. Instead of pipping a carrot onto the frosting, I used a triangle stencil and homemade orange powdered sugar to apply the designs. 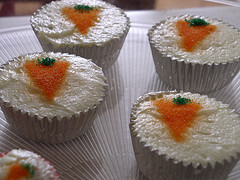 I then capped the carrots with green sugar crystals, and both the orange and green "melted" into the frosting, creating an interesting effect. A little messy, but not bad for my first such attempt. Recipes and instructions are below. Also! If you'd like one, I'm going to be somewhere I can give them away on Tuesday, March 10. Watch for more details, or email me for more info! Adapted from Alton Brown's recipe here. Put the grated carrots into a large mixing bowl and set aside. Combine flour, baking powder, baking soda, spices, and salt in a large bowl and mix well. Add this mixture to the grated carrots and toss until they are well-coated with the flour. Work the carrot mixture with your fingers to get out any large carrot clumps. In another bowl, combine the sugar, brown sugar, eggs, and yogurt, and mix until combined. While mixing, drizzle in the vegetable oil. When integrated, pour this mixture into the carrot mixture and stir until just combined. 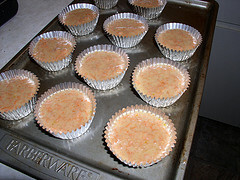 Pour batter into cupcake pans (use cupcake wrappers for best results, otherwise liberally grease pan) and fill to 3/4 full. Bake for 15 minutes, rotate in your oven, then bake for another 5-10 minutes, until the cake reaches 205 to 210 degrees F in the center (or a toothpick, inserted in the middle, comes out clean). Allow to cool completely before decorating. In a large bowl, combine cream cheese and butter (I use a stand mixer, a hand mixer would work fine, as would a large fork, though your arm may never forgive you) until just blended. Add the vanilla and beat until combined, then add the powdered sugar, a little at a time, and beat until smooth. Place the frosting in the refrigerator for 5 to 10 minutes before using. There are a lot of ways to do this - I used the ingredients I had handy. You could use orange sugar crystals, all granulated sugar with red and yellow (or orange) food coloring, or any other tricks you know. The important parts are adding enough granulated sugar to remove excess moisture, and blending until fine). In a small container, combine red sugar crystals with 10-20 drops of yellow food coloring, and stir in completely. 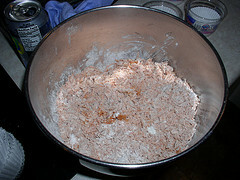 Add granulated sugar and combine until desired color is reached (adding more food coloring and white sugar as needed). When no longer wet, put mixture into a food processor or small mixer, and blend, pulsing and shaking caked sugar down into the blades. Final product should resemble superfine sugar. Using a small art knife, cut a triangle hole in the cardboard to desired size to make a carrot stencil. 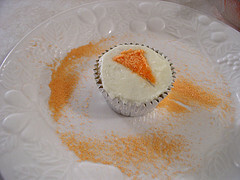 Hold stencil over frosted cupcake and dust orange sugar to make a design on the cupcake. Sprinkle a few green sugar crystals on top of triangle to finish the carrot. Sugar colors will "bleed" slightly over time. Thoughts and Observations: The cupcakes are dense, so you might want to reduce the temp to 325 and bake a little longer - mine browned slightly on the bottom. I didn't include raisin or nuts, but there would be no harm in doing so. If you like a spicier cake, I think you could easily double (or more) the amount of allspice, cinnamon and nutmeg. I find I have pretty good results when weighing ingredients instead of just using volume measurements, but either way should work. I do contend that a kitchen scale is the best tool I never knew I needed until I had one. More process shots (and larger versions of the above pictures) of the cupcakes are available here. dude those look good. i want one. let me know where you'll be tomorrow, i'll see if i can make it. I am a person who enjoys cakes in all configurations various and sundry. Even so, within the realm of greater cakedom, I find no specimen quite as delightful as a well made carrot cake. Congratulations on your mastery, and miniaturization of the form. Yay! Carrot cake! You are the 3rd person I know who made carrot cake this weekend (myself included). And what a neat way to make orange coloring sugar. I've never thought of that. This page contains a single entry by Michael Doss published on March 9, 2009 12:15 PM. What are you reading? was the previous entry in this blog. Meet and Eat tonight! is the next entry in this blog.